Died 1st December 2018. Late of Woodvale Gardens (formerly of 90 Bellevue Street) Adored father of Kim and Thomas. A much loved and loving father-in-law, Granda and Great-Granda. Will be missed and loved forever by his devastated family. A funeral service will be held on Monday 10th December at 3pm in Roselawn Crematorium. Family flowers only. 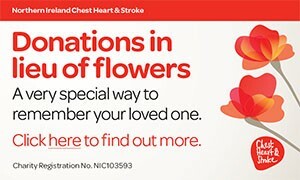 Donations in lieu if desired directly to Cancer Lifeline, 44 Alliance Avenue, Belfast BT14 7PJ or Regional Respiratory Centre, Charitable Funds, Knockbracken Healthcare, Saintfield Road, Belfast, BT8 8BH. To know him was to love him and without him there will be no perfect day. The Committee and Members of Ballygomartin Snooker Club deeply regret the death of the father of their esteemed member and former chairman Tommy Moody. Hon., Sec., K. Donaghy. I am sorry to tell you that Thomas Charles MOODY has passed away.